Robin Hood has been picking up some rave reviews since it premiered in Cannes. It’s out tomorrow. I saw it yesterday, but not in Cannes, and can thus report back without any chance of being influenced by a) the thrill of being on holiday, or b) the relief at seeing something in English with some exciting bits in it. Directed by Ridley Scott and starring Russell Crowe, it seems to have been greeted as a quasi-sequel to Gladiator, as if Crowe is playing a Blackadder-style Zelig figure whose ancestors crop up throughout history, looking and sound the same, and getting into scrapes. Well, who can blame people for having such expectations: Gladiator was, and remains, a fantastic example of the revivalist historical epic – old fashioned in tone and sincerity, but new fashioned in terms of camera technique and CGI embellishment. Crowe found his brand, and Scott put the seemingly unassailable, paradigm-shifting majesty of Alien and Bladerunner behind him. However, lest we forget, Crowe and Scott have re-teamed already, since Gladiator: for A Good Year, the belated cinematic vision of Peter Mayle’s Provence idyll, made because he and Scott are old Adland pals and neighbours in Luberon. The film was a piece of Sunday supplement froth. The sort of film that even those critics stationed for two weeks in the South of France would find insubstantial and silly. So, is Robin Hood the new A Good Year? Well, guess what, it’s a massive improvement, in that Crowe plays a warrior rather than a corporate trader, but it’s also not as good as the critics in Cannes think it is. Certainly, you have to admire Scott for steering clear of CGI overkill and seemingly creating as much of the horse- and archery-based action for real. There’s way too much slo-mo, which for me is becoming the shortcut to high drama – you could film a market trader walking to Pret in slo-mo and it would seem more significant – but if an action blockbuster is stylish, who’s complaining. I ask this question: is the story any good? After all, it’s an enduring myth that has inspired filmmakers since the silent days, and indeed provided an excellent Saturday teatime kids’ remake a couple of years ago on BBC1. So, it’s actually an “origins” story that – NOT REALLY A SPOILER ALERT – ends with Hood being outlawed by King John and with his “merry men” lined up in the trees of Sherwood Forest with their eye on the rich. This is fair enough – Batman Begins was terrific – but with the outcome preordained, does it deliver along the way? Well, there’s a complicated set-up, way too predicated on chance and a runaway horse for my liking, that involves Hood taking the identity of a Nottingham-based knight who has been killed by Evil Mark Strong and his French marauders. This leads him to Maid Marian, who’s as old as he is, and a showdown with the tax-collecting, grain-transporting military-agricultural complex. If you’re expecting lots of Evil Sheriff of Nottingham, don’t – Matthew MacFadyen is wasted in the potentially juicy part, and only gets two scenes. Indeed, many fine British thesps get little to do, including Robert Pugh, Mark Addy, Gerard McSorley and – literally in one scene as a messenger – Steve Evets from Looking For Eric. Ingmar Bergman’s old muse Max Von Sydow is imperial as the blind Sir Walter, but then he always is, and in much trashier films that something by Ridley Scott; Eileen Atkins is impeccable as Eleanour; and Cate Blanchett never phones anything in, but if I’m honest, it’s all a bit glum, a bit preoccupied with father-and-son issues and a bill of rights, and escalates in a manner that’s dramatically understandable but not narratively. 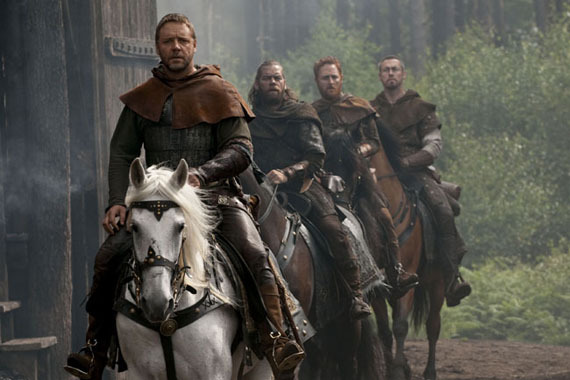 Sure, a film like this that trades on noise, bluster and spectacle has to up its game, and thus a few blokes firing arrows at some other blokes will not do in a post-Lord Of The Rings world of sieges and battlements and casts of thousands. Thus, it builds to an actual invasion of England by the dastardly French, all looking like Jay Rayner, which is staged like Saving Private Ryan except made of wood. I could appreciate the spectacle of this coastal climax, but it felt nailed on, and required us to believe that a ragtag English army, geed up by the wandering English/Welsh/Scots/Irish accent of Robin in a speech designed to conjure Braveheart, could get to Dover in an afternoon. If I’m nitpicking then it’s only because I’d grown a little tired and underwhelmed by about 90 minutes in and there was over half an hour yet to run. This is serviceable expensive modern cinema, handled with due confidence and frown, and maybe we should be grateful that the average age of its principal cast is so high and not be critical of the creaking bones of Crowe in a role that always spoke of lithe athleticism and Errol Flynn-like spark, but I’m afraid I was led up a path of great expectation by the men and ladies in Cannes that turned out to be muddy and difficult to pass. Still, funny to see ginger Dr Morris from ER as Will Scarlet, who’s apparently Welsh now, although that’s an accent that’s even harder to pull off than Nottingham. I admire Crowe for attempting the full Shane Meadows by the way [I know he’s from Uttoxeter, but an American/Australian attempting the accent would be pleased if he was in the same land mass], but it’s so inconsistent you wish he’d rolled out the Richard Burton after a liquid lunch he essayed for Gladiator. Ah, another mention of that film. Was I not entertained? Well, yes, but I wanted more.